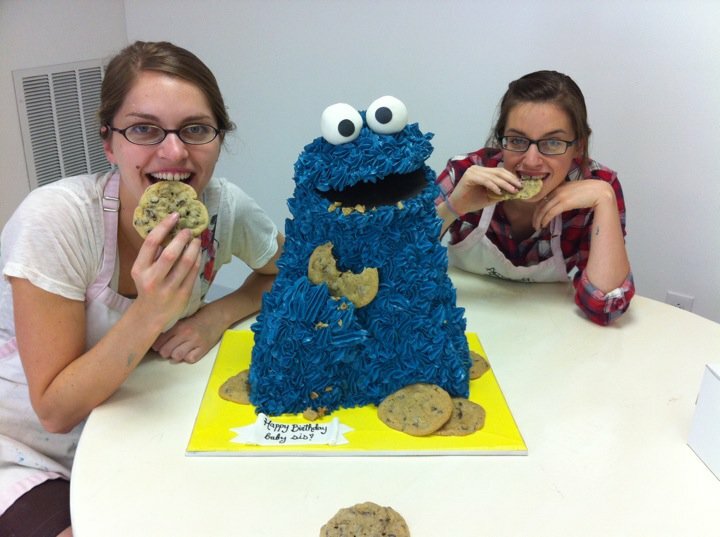 We made a Cookie Monster cake today, and we decided to video tape it so you could see in very simple terms how we go from structure to completed cake. oh.. by the way.. i looks great! When you use a flange on the board – what do you cover it with so the cake is safe to eat? We cover any wood or metal surfaces with either waxed paper or waxed cardboard. What were the measurements of wood pieces, also what did you make the head out of? btw AWESOME cake. It was such a long time ago I don’t remember. The whole cake probably stood about 2 feet tall. The top half of the head was a dome of fondant resting on a wooden support. how did the bottom of the mouth? is some cardboard covered with fondant? Yes, the bottom of the mouth was cardboard with black fondant and buttercream piped over that. How did you make the eyes? I think this is AWESOME!!! They are made of fondant. Check out http://learn.oakleafcakes.com/videos for more!